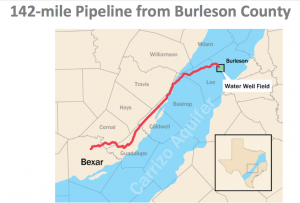 The Texas Legislature is considering multiple bills that would make it easier to transfer water from one area to another. In practical terms, this means taking water from rural areas to supply urban centers. While some water transfers may be needed, all too often these rural-to-urban transfers are being used to avoid real conservation measures. In fact, the current state Water Plan assumes that municipal demand will increase almost directly proportionally to the projected increase in our population over the next 50 years. In other words, the plan assumes that people will continue to use (and waste) water at the same rates as today, without any significant additional conservation efforts. Yet average residential water usage ranges from 60 gallons to over 300 gallons per person per day in different parts of Texas. Many Texans could easily cut their water usage in half – or even lower – without any real hardship. Water transfers just postpone the day of reckoning. At some point, Texans will need to take serious steps to conserve water. Shouldn’t we do it before our aquifers have been drained and our rural communities destroyed? San Antonio’s recent actions provide a clear vision of what this means. 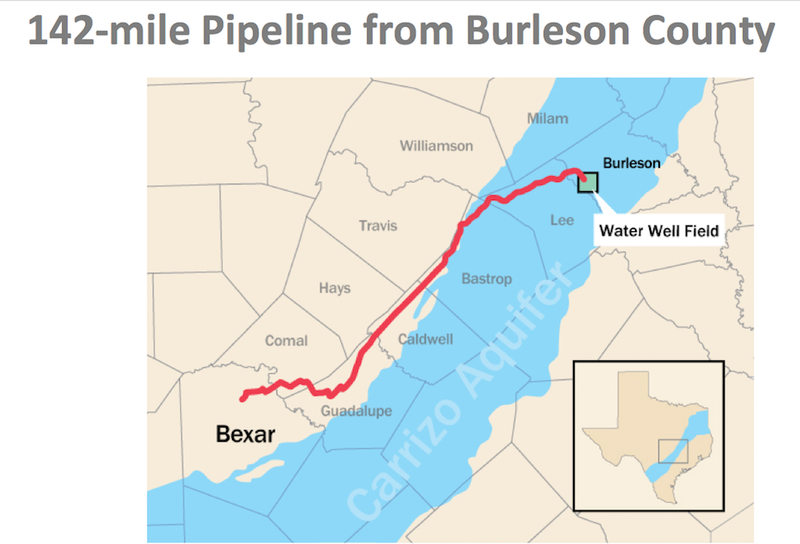 San Antonio is building a 140-mile pipeline to transfer large amounts of groundwater from some of the best farmland in our state, draining the aquifer under Burleson and Milam Counties. At the same time, the city is negotiating a deal to have some of the water bottled for sale! We must conserve first, transfer later! call the Capitol Switchboard at 512-463-4630. My name is ____, and I am a constituent. I urge Senator/ Representative _________ to oppose SB 1907/ HB 3298_____. We should not be spending money on a study about how to transfer water without ensuring that conservation and preservation of our water resources is placed first. And it is vital that the future of ALL Texans — including those that live in areas where water would be taken away from — be considered. If your are a constituent of Senator Charles Perry or Representative Lyle Larson, the authors of this bill, please urge them politely to accept amendments to address these problems. The Calendars Committee has the power to set HB 3298 for a vote by the full House — or stop it completely. If you live in one of these districts, PLEASE make an extra effort to call, and get as many of your friends and neighbors to call and email as possible! Conservation must be the first priority for everyone. No transfers should be allowed until the receiving area has first implemented all possible conservation measures. Texas cannot use transfers to disguise unsustainable practices to water usage. That doesn’t solve the problem, it simply postpones the day of reckoning, and makes it likely that the reckoning will be even more painful. Every aspect of water planning must include planning for sustainability in perpetuity. There is no justification for destroying rural communities’ futures. It will not be possible to expand or even maintain these communities if there is no water available. While some transfers to urban areas may be necessary, they must consider the long-term impacts on the areas from which they are taking water, not simply whether there is an excess supply at this specific time.